Bass and contrabass trombone of Malaga Philharmonic Orchestra. Was born in Malaga on the 11th of November 1981. His interest in music started while playing with the Archicofradía de la Expiración Band and from there decided to study, matriculating in music schools and university music courses and decided to dedicate his professional life to music. 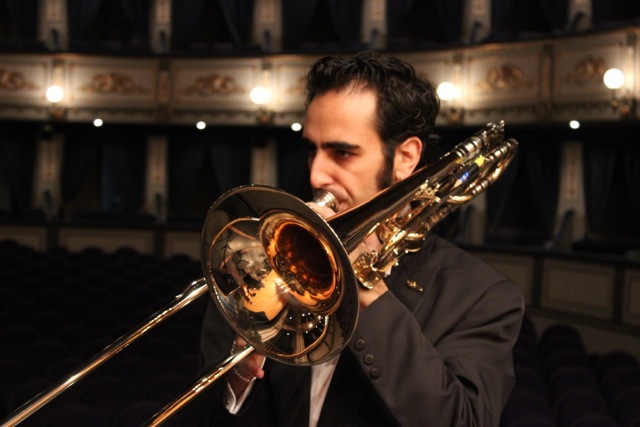 He has a Diploma in Music Teaching from Málaga University (2002), Licentiate in Musicology from The University of Granada (2004) and Licentiate in Trombone from Malaga Conservatoire of Music (2007). He has been a member of numerous youth orchestras both nacional and international such as The National Youth Orchestra of Spain (J.O.N.D.E. ), Andalusian Youth Orchestra (O.J.A) and The National Youth Orchestra of Scotland (N.Y.O.S.) He has participated on various occasions in EUROCHESTRIES (Meetings of European Youth Orchestras). He has played with many different orchestral formations amongst others the City of Granada Orchestra (O.C.G. ), Malaga Symphony Orchestra (O.S.P.M. ), City of Almeria Orchestra, (O.C.A.). He has participated in many courses with a multitude of professional trombonists, international soloists, European conservatoire professors and many Principal players in the top European orchestras such as Ben Van Dijk (Bass Trombone Rotterdam Philharmonic and Professor at Amsterdam Conservatoire), Stephan Loyer (Bass Trombone of the Spanish Radio Television Orchestra), Raul García (Bass Trombone of the Barcelona Symphony Orchestra and Professor of ESMUC), Stefan Schulz (Bass Trombone of the Berlin Philharmonic Orchestra), Roger Argente (Bass Trombone of the Royal Philharmonic Orchestra, London) Keith McNichols (professor of Bass Trombone at the Guildhall School of Music, London), Jürgen Van Rigen (principal Trombone of the Royal Concertgebouw Orchestra, Amsterdam), and Dominique Rombaut † (Principal Trombone of the Malaga Philharmonic Orchestra). Amongst other educational positions he has been professor to the Andalusian Youth Orchestra (O.J.A. ), being the principal teacher during the 2010/2011 and 2011/2012 seasons. He has given Masterclass courses at the Conservatoire Manuel de Falla de Alcorcón in 2011. Conference-concert at Malaga University in the firs international trombone congress. President of AMAT (Malaga trombone Assotiation), elaborating courses, concerts, Master Class, Congress… First president of AMAT.